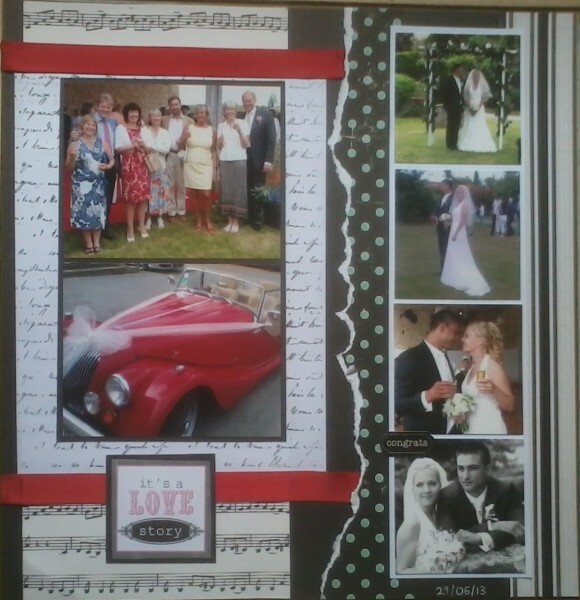 I thought Id show you the layout i did last week of Remys wedding in June, very pleased with it. it is scraplifted from one I pinned eons ago. Ive probably mentioned most of the people in the main photo - on the left in the blue print dress is Veronica, who was sadly widowed a year later than me in similar circumstances, next to her is David Williams, owner of the red Morgan car and his wife Pam in red - they invite me up to dinner alot and have been good friends (theyve got a second home here), then there is a couple I didnt know then me (Im brown because it was the weekend Id just got back from Greece) and then o the far right end is Sally and Peter who live in the chateau here and who are also very good to me and feature in my posts. The photos of Remy and Jessica are mostly cut from their thank you card, before anyone says how well my photography has come on! That's a super layout Maria. Lovely pics. That's super, loving the red and B/W, great job. Great layouts, drooling over the Morgan, as I can never have I would like just a short spin in one. Smashing layout Maria. Nice to put faces to names that you mention. That is gorgeous Maria, love the b,w,r collour scheme.